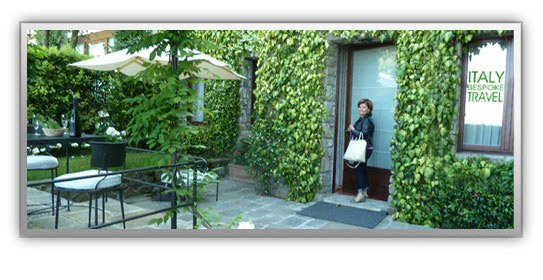 This Internet website is provided by Italy Bespoke Travel (IBT), a division of Luxe Wellness in Italy. By using this website you agree to be bound to the following Terms and Conditions. Please be aware that IBT may revise these Terms and Conditions from time to time by updating this posting. Please read these Terms and Conditions carefully. IBT maintains this website for your personal utilization, information and communication. You should assume that everything you see or read on this website (such as photographs, texts and other materials – "Content") is the property of IBT and its licensors and partners. Without IBT's prior written permission, you may not sell, reproduce, distribute, modify, display, publicly perform, prepare derivative works based on or otherwise use any of our Content in any way for any purpose including using our Content on any other website. However, you may electronically copy or print pages from this website for personal or non-commercial use provided that you use a notice on each page. Which service is the one that best suits your needs? You may add the service fee to the price of the gift. Your guests are accustomed to paying taxes, shipping, handling and gift wrapping when purchasing store bought gifts. Fee includes Bespoke Honeymoon Itinerary created by Italy Bespoke Travel and our superior services in managing your Honeymoon Registry. This information may be added so your guests appreciate the quality and thought that went into their gift to you! IBT manages all funds that are received through the Honeymoon Registry. You can collect your gifts in scheduled payments: three weeks before the wedding date; one week before the wedding date; and thirty days after the wedding date. Members can collect your gifts by: (1) having a check mailed directly to you in the U.S.; (2) via an ACH bank to bank transfer in the U.S. for an additional bank fee of $12.00 (3) International clients are required to use PayPal for transfer and all PayPal terms apply. For checks, overnight delivery is available Monday through Friday for an additional fee of $26.00 in the U.S. and will be deducted from your total gift amount. Checks will be sent to the address the Member provided, and IBT will not be responsible for lost checks or untimely delivery of regular mail. A Stop Payment on a lost check is subject to a $30.00 bank fee. Redemption in the form of a bank check, bank ACH, and international wire transfer will only be issued in the name and address of the designated Traveler ("Member"). For PayPal redemption requests, only the email address that is first registered with IBT can be used. Each individual gift to the Member is available after a 72-hour waiting period. If a Member changes a Wedding Date, you are responsible for notifying IBT and having the date changed on the website. If a wedding is canceled, IBT will coordinate with the Member. IBT's policy is similar to any gift registry where gifts are being returned to giftgivers. Member Registry Outside of the U.S.
You may register outside of the U.S., but this requires a PayPal account for you to receive your gift money or you will receive your gift check in U.S. currency with the cost of postage deducted from the gift amount. As a giftgiver you may only purchase a gift by credit card unless special arrangements are made with IBT. Upon the completion of a gift given to an IBT Member, there is no refund immediately possible. IBT has sole discretion to determine the validity of a return or cancellation request. IBT requests gift givers to contact our customer service support line if there has been an error regarding the amount of the gift or the IBT Member for whom it was intended for. If a gift giver disputes a valid charge from IBT and the Member in question still has a balance, the disputed amount will be returned. If the Member has no current balance, the disputed amount will be paid back from any future gifts they may receive. IBT will contact the gift giver in an effort to resolve a disputed gift. At any time, a Member may disable their account and receive the remainder of their balance (minus the applicable service fee. Removing the registry must be coordinated with IBT. A Member account with a balance that is not redeemed sixty days after the wedding date will be closed. IBT will attempt to contact the Member by email and a notification letter. The Member acknowledges that IBT makes no claims or representations regarding any and all tax obligations or consequences, if any, that may result from activities as a Member of IBT and the Member's use of the services provided by IBT. Furthermore, the Member agrees that IBT has no obligation to maintain records or provide documentation of transactions with charitable/non-profit organizations for tax reporting purposes. Your use of the IBT website is at your own risk. IBT does not warrant or represent that our Content is accurate, error-free, truthful or reliable or that your use of such material will not infringe rights of third parties. IBT does not warrant that the functional aspects of the website will be error-free or that this website or the server that makes it available are free of viruses or other harmful components. If you have a registry on the IBT site, you should check the IBT registry periodically to insure that it remains accurate and up-to-date. IBT reserves the right to correct any errors on this website. If your use of this website or our Content results in the need for servicing or replacing property, material, or equipment or data, IBT is not responsible for those costs. Without limiting the foregoing, everything on our website is provided to you "AS IS" AND "AS AVAILABLE" WITHOUT WARRANTY OF ANY KIND, EITHER EXPRESSED OR IMPLIED, INCLUDING, BUT NOT LIMITED TO THE IMPLIED WARRANTIES OR MERCHANTABILITY, FITNESS FOR A PARTICULAR PURPOSE, OR NON-INFRINGEMENT. IBT MAKES NO WARRANTIES ABOUT THE ACCURACY, RELIABILITY, COMPLETENESS OR TIMELINESS OF THE MATERIAL CONTAINED ON THIS WEBSITE, OR ABOUT ITS SOFTWARE, TEXT, GRAPHICS, AND LINKS OR RESULTS TO BE OBTAINED FROM USING THE WEBSITE. IBT does not make any representation about the quality of any product, services, information or other material purchased or obtained by you through the use of this website. NEITHER IBT NOR ANY PARTY INVOLVED IN CREATING, PRODUCING OR DELIVERING THIS WEBSITE SHALL BE LIABLE FOR ANY DIRECT, SPECIAL, INCIDENTAL, CONSEQUENTIAL, OR INDIRECT DAMAGES RESULTING FROM YOUR ACCESS TO, OR USE OF, OR INABILITY TO USE THIS WEBSITE AND OUR CONTENT, WHETHER BASED ON WARRANTY, CONTRACT, TORT OR ANY OTHER LEGAL THEORY, AND WHETHER OR NOT IBT IS ADVISED OF THE POSSIBILITY OF SUCH DAMAGES. IBT controls and operates this website from its headquarters in New York, New York, United States of America and makes no representation that the material on the website is appropriate or available for use in other locations. If you use this website from other locations, you do so at your own risk and are responsible for compliance with applicable local laws, keeping in mind that access to our Content may not be legal by certain persons or in certain countries. If any portion of these Terms and Conditions is held to be unenforceable, the unenforceable portion shall be construed in accordance with applicable law to the greatest extent possible and the remainder of the provisions shall remain in full force and effect. Any cause of action you may have with respect to this website must be commenced within ninety days after the claim or cause of action arises or such claim or cause of action is barred. These terms will be governed by and construed in accordance with the laws of the State of New York, United States of America without regard to its conflicts of law provisions. Any legal action or proceeding relating to your access to, or use of, this website or our Content will be instituted in a state or federal court in New York County, New York and you hereby agree to submit to the personal jurisdiction of such courts. You agree to defend, indemnify, and hold harmless IBT, its officers, directors, employees and agents from and against any claims, actions or demands, including without limitation reasonable legal and accounting fees arising from your use of this website or our Content or your breach of these Terms and Conditions. IBT shall provide notice to you promptly of any such claim, suit, or proceeding and shall assist you, at your expense, in defending any such claim, suit or proceeding. The trademarks, logos and service marks (collectively the "Trademarks") displayed on this website are trademarks of IBT and others. Nothing contained on this website should be construed as granting, by implication, estoppel, or otherwise any license or rights to use any Trademark displayed on this website without the written permission of IBT or such third party that may own the Trademark displayed on this website. Your misuse of the Trademarks displayed on this website, or any other Content on this website, except as provided herein, is strictly prohibited. All Content included on this website such as text, graphics, logos, button icons, images, audio clips software and the compilation of all Content is the property of IBT or its Content suppliers and protected by U.S. and International copyright laws. The reproduction, modification, distribution, transmission, republication, display or performance, of the Content on this website is strictly prohibited.Copyright Infringement IBT respects the intellectual property rights of others. Accordingly, IBT has a policy of terminating in appropriate circumstances the account of any IBT user who repeatedly posts infringing material on the IBT site pursuant to Title 17 of the United States Code, Section 512, as amended by Title II of the Digital Millennium Copyright Act.